Precious metals futures settled modestly lower Wednesday, with gold and silver recording their third straight session losses. Gold for April delivery fell $5.50, or 0.4%, to settle at $1,257.40 an ounce on the Comex division of the New York Mercantile Exchange. "So far, this week, we have been in a ‘news vacuum’ of sorts that has left gold to bounce around as prices are largely being driven by trader positioning ahead of the ECB," MarketWatch quoted Tyler Richey, co-editor of The 7:00’s Report. "So if the ECB underwhelms the market again like they did in December and the dollar spikes lower, then expect gold to extend its recent gains." On Thursday, the European Central Bank will announce its decision on monetary policy. Many economists are expecting more stimulative measures. 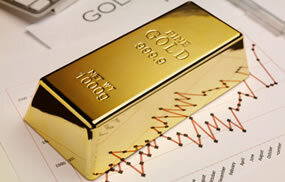 Gold prices ranged from a low of $1,243.60 to a high of $1,265.70. They dipped less than 0.1% on Tuesday and fell 0.5% on Monday. For the week so far, gold futures are down 1.1%. As recently as Friday, they closed at a 13-month high and logged a weekly increase of 4.1%. Silver for May delivery shed 2.4 cents, or 0.2%, to settle at $15.366 an ounce. Silver prices traded between $15.20 and $15.46. They are down 2.1% on the week. April platinum turned down $6.60, or 0.7%, to $982.80 an ounce, ranging from $973 to $987.70. Palladium for June delivery slipped 70 cents, or 0.1%, to $566.15 an ounce, trading between $549.70 and $571.40. Gold declined $20.60, or 1.6%, to $1,246.40 an ounce. Silver declined 39 cents, or 2.5%, to $15.27 an ounce. United States Mint bullion products registered gains of 2,000 ounces in gold coins and 208,500 ounces in American Silver Eagles. The U.S. Mint this week limited sales of Silver Eagles to 1 million coins. Distributors ordered 96.8% of them through Wednesday, leaving 32,500 left until more become available next week. Their cumulative sales are at 11,967,500 coins, or 24.4% higher than through the same time in record year 2015.